Hi! Sprite here. 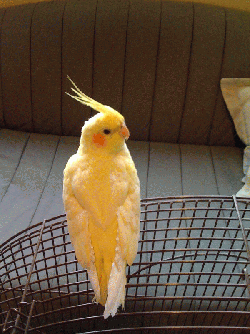 I`m a Lutino cockatiel who is very friendly and loves head scritches. I eat Nu-trian cakes and love the green pieces of Zupreem (Harvest Feast pellet mix). I`m still not not fully eating leafy greens. My latest vet recheck found no obvious heath issues, most likely because I`m still a young bird. I`m still molting heavily and should settle down once I`m on a balanced diet long term. They tell me I`m a girl because I don`t whistle or talk. I also have some possible yellow pearling on my wings. I make a cute intonation with my chirps that are very expressive. As you can see, I`m VERY adoptable ... won`t you come visit and take me home?